Will it slow down my computer? Will it effectively block viruses and other malicious software? Will it block me from using programs that I need? Will it keep my personal information and my valuable documents and data safe? Shopping for an antivirus can be a real hassle. Who wants to download antivirus after antivirus, testing them out for 30 days before moving onto the next? We're here to make the choice easy for you. Teflon Security is all about enhancing your PC's protection and performance. It offers numerous handy security features and PC improvement tools, such as Fix & Repair, PC Performance, PC Protection and Privacy Protection. As its name implies, Teflon will block out infection with smoothness and efficiency. 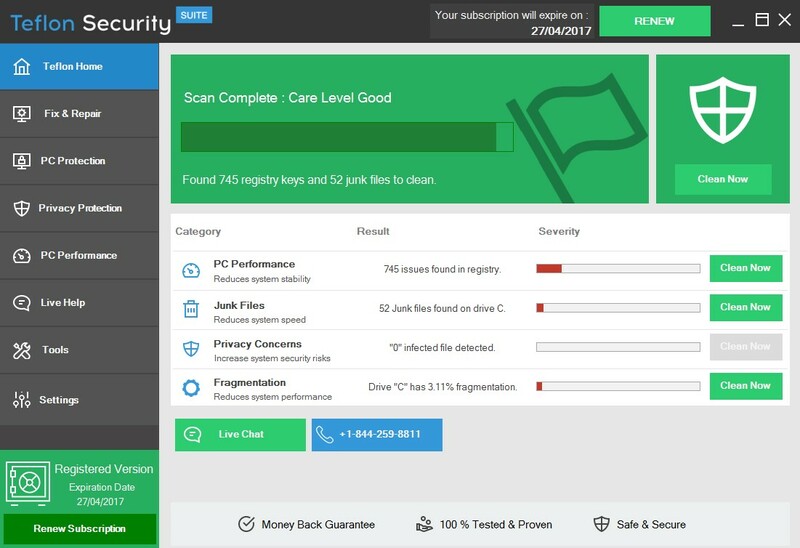 This software targets the issues with ninja-like speed and selects the best method of repair – so that you can go on with your daily computer activities worry-free. The installation itself is ridiculously fast, and the tools themselves function really quickly, so that you can get the protection you need on your computer as soon as possible. For a more in-depth improvement of your PC's overall speed and efficacy, Teflon offers its Fix & Repair features, including Disk Defragment, Registry Optimizer, Disk Space Analyzer, Backup Recovery, and System Report. All of these are very handy. 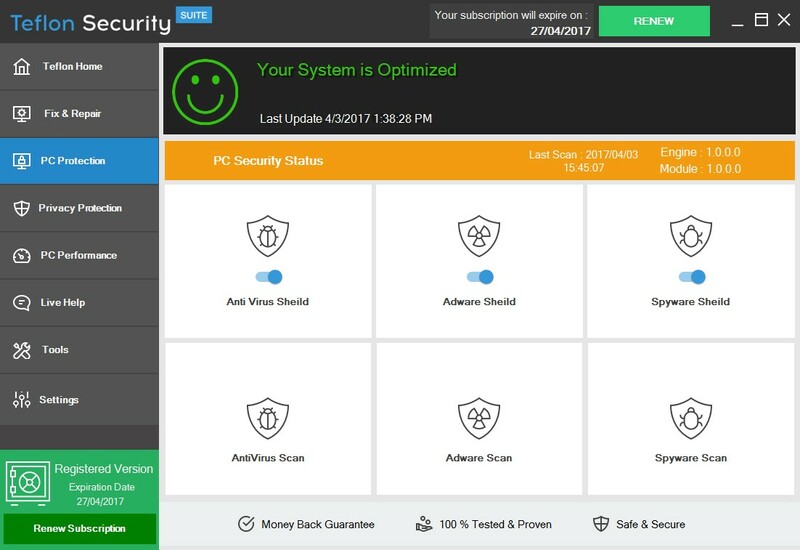 Registry Optimizer will scan your computer to determine what areas need work in terms of performance and protection. Every PC needs a good disk defragmentation once in awhile; this rearranges your stored files for more efficient access and use. With Teflon, you can leave this running in the background as you continue your computer tasks without worrying about it slowing down your activities, which is always a plus. This section includes useful tools such as Speed Up PC, Remove Duplicate Files, Junk File Cleaner, Startup Manager, and Uninstall Manager. Within just seconds of scanning, Teflon detects hundreds of unnecessary duplicate or junk files and potential threats slowing down your computer. When prompted to repair, it quickly deletes these junk files, making a noticeable difference in speed. Teflon provides you with a full checklist of what the software will eradicate for you to double-check beforehand, in case you worry about an important file being removed. This is a great feature and ensures peace of mind. After scanning the list point by point, it was clear that this program had picked out only actual junk and nothing of value – demonstrating its extreme efficiency and reliability. We live in a world of sensitive information stored electronically, and with the correct data input, a world of information can be accessed by anyone. It is vital that your data and the documents that are important to you remain protected. There is nothing worse than a virus or other malware crashing your computer and rendering your valuable files inaccessible. Teflon understands this and makes sure to thoroughly protect you from spyware, adware, and viruses, so that you do not need to worry about constantly backing up your information. With its Privacy Protection feature – including Search Engine Protection, DNS Protection, and File Shredder, among others – Teflon also keeps your browser from getting hijacked, which is an excellent tool not offered by all of its opposition. Teflon provides useful, efficient, and speedy features that protect your computer and your privacy, as well as optimize your PC, which will extend its life and your enjoyment of your investment. We give the features offered by this software an overall rating of 10 out of 10. Teflon is extremely user-friendly, so that even the most inept user can easily navigate the tools and options, and get the most for their money! With a colourful interface and a clear division of the available tools and features, you simply cannot go astray. Of course, if ever you do find yourself stuck, the Live Help option makes customer support only one click away! You will simply be asked to input your question, and a representative will e-mail you back promptly. The response time is quick and the support centre staff is friendly and eager to help with any questions. Teflon also has a toll-free number to call for those who prefer over-the-phone customer service. When it comes to the protection of your information and programs, there's nothing more important than getting the help you need when you need it. We give a score of 10 out of 10 for tech support. Using our bench-marking software we gathered some information before installing Teflon Security so we could compare how the system looks after it is installed. In the pre-installation bench-marking results the CPU speed was 25000 MIPS, it could process 25000 million instructions per second. The memory speed was 21800 Megabytes per second. Hard drive speed was 404 Megabytes per second and 2D video speed was 19.4 MP/s (processing millions of pixels per second). After installing Teflon Security Suite security, we ran another benchmark test to see how the software has impacted our system and to our surprise the results were great! There was a slight different in CPU, Memory and HD speeds, but they were extremely minimal. Working with the software on did not show any signs of lag or extra spikes in usage. CONCLUSION OF THE TEST: Teflon Security Suite while providing a lot of functionality has a surprisingly small footprint. Users will not feel a difference before and after installing Teflon Security. This is a clear choice for any type of user, including gamers and power users as they use up tons of resources. Teflon Security earns a score of 10 out of 10 in the system performance test. 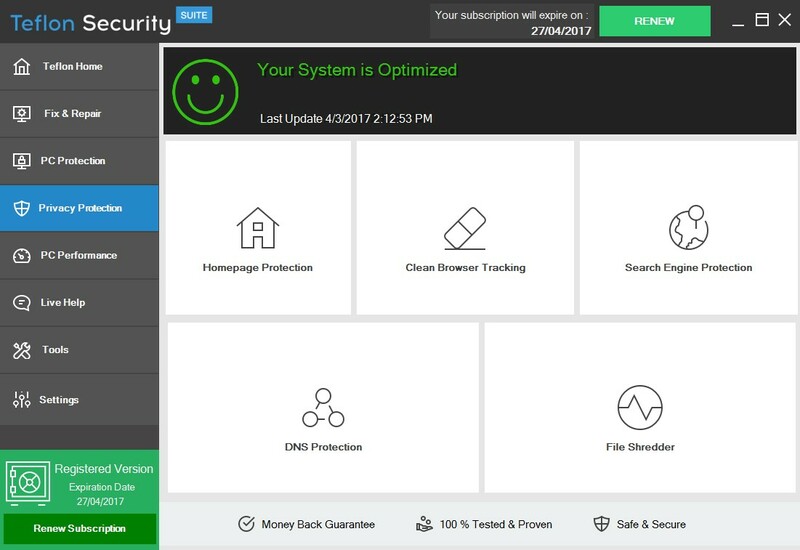 When you turn on your computer, Teflon Security provides a pop-up window with a quick summary of the issues it has solved and items it has improved on in the past few days. This is a really neat feature and lends you peace of mind that your PC is constantly secure and running at its best. Teflon Security Suite will be sure to optimize your computer and protect you against dangerous malware and viruses. Its ease of use, speed, and efficient targeting of all your PC's issues make it a must-try. Try out the 30-day trial free of charge – you won't be disappointed!